What is interesting is that for low pass filters, the Butterworth filter is the same as the second order filter implementation. Linkwitz-Riley filters have a lower amplitude than the others, and Chebyshev type 2 has definitely a different behavior than all the others (which is due to the fact that its prototype is different than for the others, it’s not based on band pass, but band stop). With all these options, I think Audio Toolkit can cover any basis. 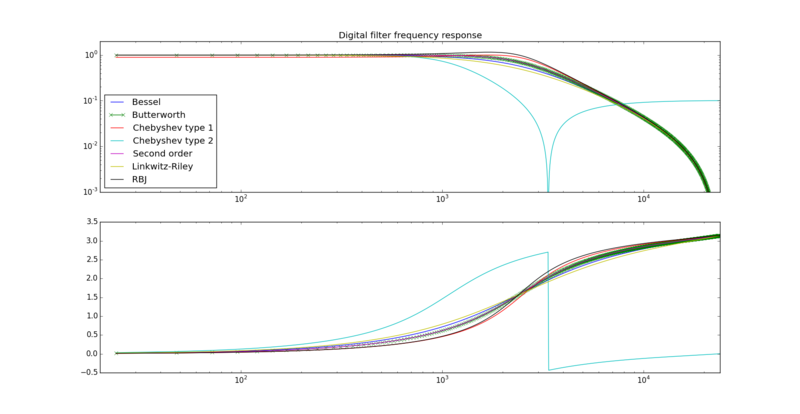 Thanks for this intriguing post describing various types of low pass filters. It is interesting that you found the Butterworth filter to be the same as the second order filter. I never knew that these two were the same. Very interesting. Appreciate the share! To be fair, it’s my version of the second order filters that match Butterworth. Others, like RBJ which are also second order filters, don’t.